https://www.chicago-photographs.com is pleased to feature this marvelous contemporary Chicago photograph by Angie McMonigal, one of Chicago’s most prolific and talented photographers. 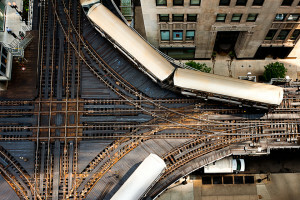 This birds-eye-view of the iconic Chicago Transit Authority (CTA) at Lake & Wells gives you a look at one of the busiest intersections of public transportation in the city. With 5 of the 8 CTA lines traveling through here, only the red, blue and yellow lines miss this busy intersection. This image was made from the parking garage at the northeast corner of Lake & Wells and might be the most popular parking garage for photographers to catch a unique perspective on the city. While I made quite a few images from here, this image in particular was a favorite of mine because of the converging trains within the sunlit portion of the tracks. Angie McMonigal grew up in rural Wisconsin but has found her true hometown in Chicago where she has lived since 2000. She particularly loves the energy of the urban environment and enjoys photographing the urban landscape and more specifically architecture and its details. Her work has been exhibited nationally and has been internationally awarded. If you are interested in acquiring these photographs, follow this link, Vintage Chicago Photography, for more information on these photographs and more.